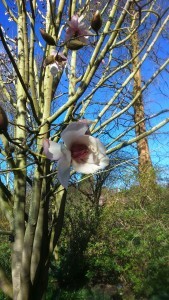 Magnolia campbellii cultivar is a member of the Magnoliaceae family, and can be found in the Winter Border. The Himalayan pink tulip tree, has flowers up to 20cm across, and may not start flowering until it reaches 30 years of age. When it is in flower it is an amazing sight against a sky blue background, well worth waiting for. However, a word of caution it is a large growing tree and it flowers open very early in the year and can be easily damaged by frosts, so it needs shelter and a mild winter to flower well. The flowers are very large and goblet shaped which open up and spread wide later.